Happy Mother's Day and a blast from the past! I finally sat down and finished my rug today. It isn't that wide, but it sure is long, 144" long. Lots of braiding and sewing in this one. I did traditional braid with 2" strips, sewing each piece by hand, as I went along. I used scrap wools, including flannels, thinner and thicker, and even some worsted weight. I have to admit, the worsted gives it a more solid feel, but the flannels make it too cushy. I prefer a thick heavy rug to walk on. But for now, this one will do. 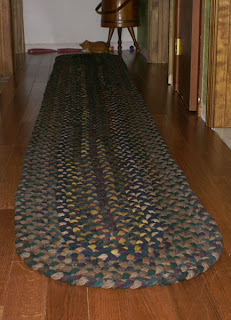 I may even take the ends and cut across and make it into a rectangle rug. Just doesn't look right in that shape, in that hallway? We still have to finish off the flooring, but we are putting up wainscoting, so it will go in a bit at a time. Everyone is talking about making wool quilts lately. I have always loved working with wool and since I was in a lazy mood today, I decided to make some wool blocks. I plan on making a full sized quilt, by making blocks with various designs from my books. Then I will place them together and fill in where needed. I may do edges and I will probably embellish a bit, here and there, so it will be a work in progress. 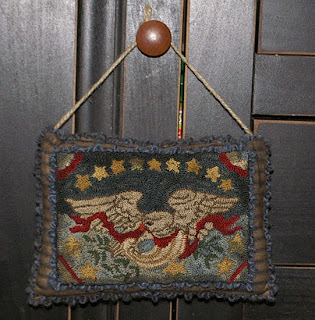 I have a lot of scrap wool, some too thin or too thick for rug hooking, so this is a perfect project to use some of it up. Unfortunately night shot using flash, so not do wool work, justice. I also did a block with a house and cat, but not enough time to finish that one tonight. I will keep the theme with cats, flowers and birds and maybe a few panels with stars to fill in. I finished my newest piece today and have it listed at my ebay site. I love this piece and hope it does well, it is a hard one to part with. This will be my last for a while, at least I say that, lol. I will be starting a new one of Lynette this week, so I will be working on hers and trying to get in a few of my own, along with some new patterns. I love how he came out and the perfect day to finish him. He is an all american dog, proud to carry the flag. The backing is a blue ticking and I used a black wool yarn to edge the pillow with. For those of you who have bought or do buy the dog pattern, I will send this one along, as well. I have another piece, but ran out of time, so tomorrow I will finish that into a pillow. In other news, Dora is still being Dora. She has this thing about opening doors and closets. She decided to check out my cabinet in my old office and see if the cat nip was still hiding in there. 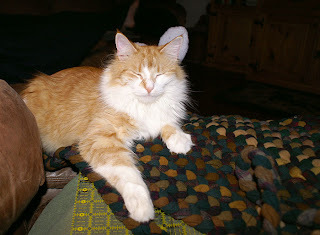 No catnip, but some old flannel cloth looked nice and cozy. I finally got a chance to do up the patters for my latest creations. I have two sets, one with the newest angel designs and the other has the bird dog with sticks and the pull toy kitty. 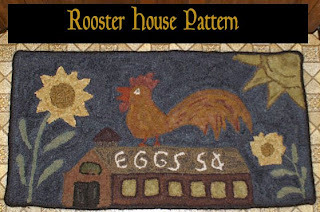 I also did up a single pattern of the rooster house design, that I made for my kitchen. Epatterns are great because you can get them soon after you make payment, so no waiting for the mail and no shipping costs. 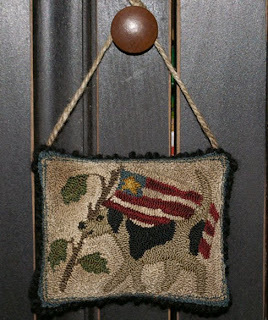 I know when I am in the mood to make something new, I want to make it now;) You can enlarge them for rug hooking or reduce for punch needle. They are true pdf files, so they will work on all systems and allow you to reduce them before you print them out if you are doing punch needle. The designs can easily be adapted for stitcheries and applique, as well. You can find them at my ecrater site along with the other patterns that I am offering. Hopefully in the next week, I will have new pattern booklets for you to enjoy. To celebrate the holidays, I am offering two E - booklets for 15.00. My E booklets have 5 to 6 patterns and some that are main patterns with additional motifs that you can add on.The can be used for hooking or punch needle. 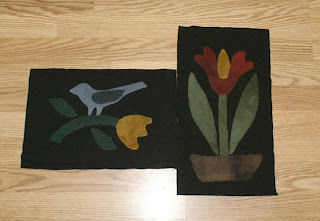 You can also stitch them or make them into appliques, feel free to be creative. You can go to my Ecrater site and pick the books you would like, then email me with your choices and i will bill you with the discounted price. It is a great way to try my E patterns and the americana set is perfect for the upcoming holidays. This offer is good until Monday, May 25. Today, I took the day off and went for a walk. 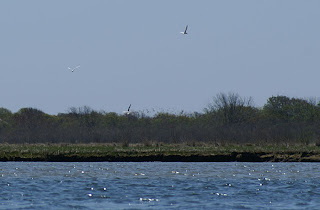 We went to Ninigret park, which is an old airforce base that has been made into a wildlife sanctuary. The new paths are gravel, so it is nice to walk on and the paths go through wooded areas, fields and points where you can enjoy the breezes of the salt water pond and the ocean beyond. 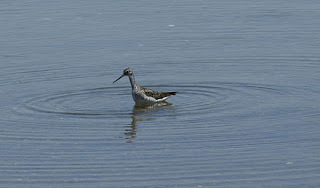 There are different sections of the park and in one cove we saw a Sand Piper darting about in the shallows looking for a meal. He was all by himself, usually they are in groups, darting back and forth in the sand and waves. At the point, we watched as the seagulls soared in the winds. Beyond the trees are dunes and the ocean. 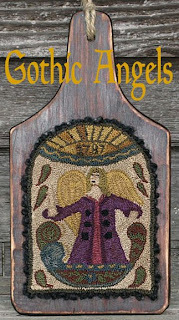 I finally mounted my angel design and have it listed on ebay this week. If you would like to have this beautiful piece for your own, you can visit my ebay site to see my offerings. Hopefully I will have my newest piece ready this weekend. I am making a special board to mount it on, so look for pictures soon. Last, but not least, is Dora, being Dora. She is just too cute and such a pain and she knows it. This is her rare moment of being nice. 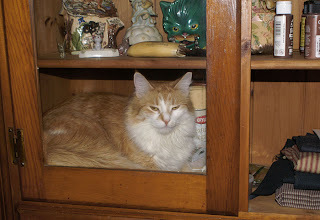 The rest of the time she was opening doors and drawers and trying to get the cat treats on her own. She is just too smart for her own good. This is a good picture, showing her size. 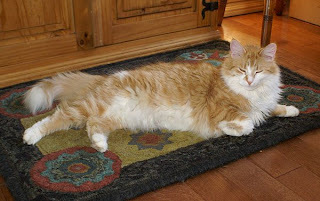 That is a large rug and she fills a good portion of it, and she is still growing. 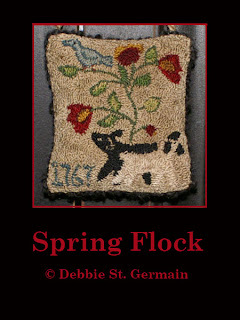 On my ebay group, USAPRIM, we had a contest to make rugs made from patterns, Kelley and I did. I offered a prize for anyone doing the one I drew and kelley had prizes for hers. 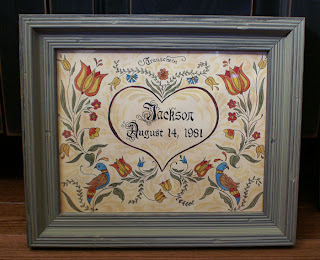 My prize was a custom fraktur with their wedding date on it. It has been a long time since I have done frakturs and I did not realize how bad my eyes have gotten for closeup and small details. Guess I need to make an eye appointment before I make any more;) I did do another one and messed it up so badly, it went into the garbage. I really do love to do frakturs and will be painting again and maybe even some folk art pictures, as well. Hopefully Ginger will like her prize, imperfections and all. The areas around the background scrolls, that look smudged are actually part of the tea ink I use to antique the paper. Also, check out Cyndi's blog (She Seeketh Wool), on the left. 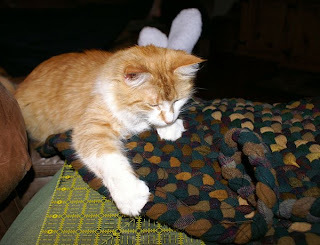 The rug she made is from a design I made for her. She did a beautiful job with the colors and hooking. I am still working on my braided runner, but I think one more round should do it. It is not wide, but the length is what takes time going around. Once I finish that, I can go back to my large hooked runner and finish that. 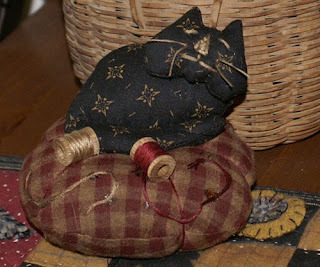 I made up a some more Kitty pincushions from Rock River Stitches. They are fun to make and work up quick. I think they will make great gifts to send for fun. I am experimenting with different materials to see what I like best. 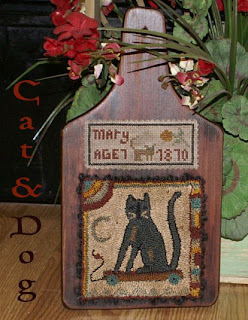 This one I did in black material for the kitty and a homespun for the base. I like working with homespun, it is soft and easy to handle. This one is my favorite, so far. The picture does not do it justice. I had extra room, so I put two spools on it. 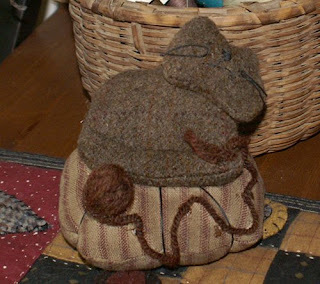 The second one I did in ticking for the base and the kitty is made of wool. Wool is definitely easier to work with, and it hides a multiple of mistakes;) I really need to pay attention to my sewing, to keep the circles in shape, but mine end up a bit off here and there. I took some yarn and made a little ball out of it, love the look. I will make more when I get a chance and try different types of wool too. 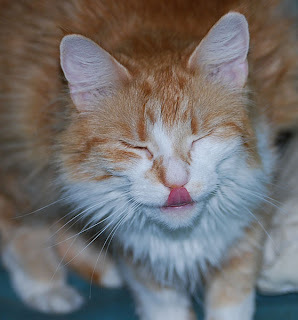 My son bought himself a new camera and when he came to visit, he took pictures of the kitties. Laughing and sticking her tongue out, at us. She really is a smart alec. Izzy is my son's cat, but he couldn't keep her in their new apartment, so she is living with me for now. 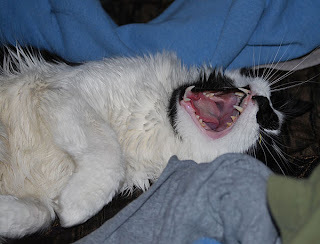 He said she was yawning, but I think she is growling at him, lol. We used to call her psycho kitty, she growled at me and the other animals. Now she follows me around, and when he comes over, she growls at him. She is a cat with attitude. "I am not going home with you, I like it here and my new sister, try and take me, I dare you!" Today was dollar day, so I hit our area Savers. I only found two items, but it is good wool and at a dollar a piece, you can't beat that. I really don't like the cutting and washing and dying, but it is one way I can save money and keep enjoying wool crafts. I also lucked out and found some old quilting magazines. Love it when I find those and there are some great patterns in them, that I will definitely be making. 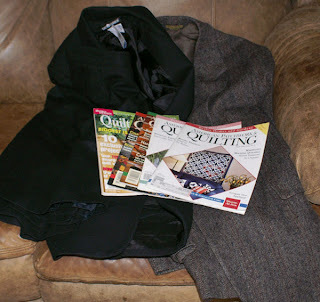 The mens jacket will be over dyed with an antique black, I need more for my big rug. The other is a black jacket and skirt, so lots of wool for a dollar. It is great for outlines and penny rugs. I also got a package from my dear friend Cyndi. 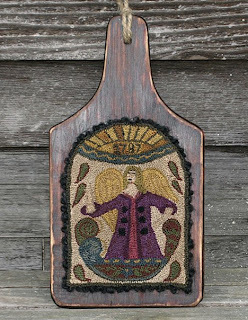 She sent me one of her beautiful rugs, a gravestone angel. It is perfect over my key box, needed something for that space. A lot of people have been talking about Mother's Day and their moms and it reminded me of how much I miss my mom. Mothers are not perfect and they can make us crazy as times, but no matter what, we will always love our moms. This is a photo of my mom, she was around 18 at the time, I think. 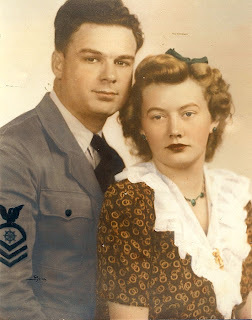 They got married around the same time my dad went into the Navy during World War II. My mom was a beautiful woman, both inside and out and was always there for us and for others. She loved to sew and craft as did her mom and they are the ones who instilled the love of creating in me. So, for this mother's day, I thank my mom for my life, my creative side and most of all, her love. One thing my mom did was sewing and she loved to make clothes. With eight kids, she was very thrifty, so most of our clothes were handmade or hand me downs that she recycled. We were not poor, but coming from the depression, my parents were big on saving, not spending. The other day, someone mentioned proms coming up. 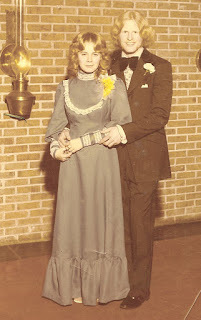 I was lucky to go to the prom with my sweetheart, of almost 34 years now. My mom made me my dress, which at the time, I was not too happy about;) Then she took me to a stylist who thought spit curls was cute, haha. My dad told Bill he had to cut his hair before we got married, it was down his back before. So, he cut it early for the prom. This was in 1975, talk about a blast from the past, lol. I thought it was fun to do with my mom's picture, since we are around the same ages in these photos. Today I made something new from a pattern made by Tammy of Rock River Stitches. It is such a cute pattern, that I will be making a bunch of them for friends. Tammy's patterns are really great to work from, simple and easy to follow. But, you know me, I cannot follow directions, I just make things, lol. Then I see what I did wrong and try to correct it the next time;) I definitely need to practice my machine skills, I cannot seem to stay on track when I am sewing. So, mine is a bit off and not as nice as hers, but not bad for my first try. I do have a hard time working with small pieces. 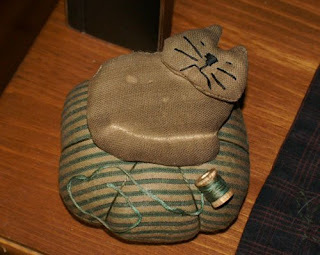 I used heavy tan ticking for the kitty and light weight cotton ticking for the base. Then I sprayed it with walnut spray to age it. The spool I got in a package from the craft store and then I wound a piece of my dyed floss around it a bit. I think it will be fun to find mini sewing items and try different things with the designs. I worked on my braided rug tonight and making progress, slow but sure. Of course, Dora has to get her paws into the action and help out. Here she is inspecting the rug for mistakes.